"The diesel price has not been hiked as such. 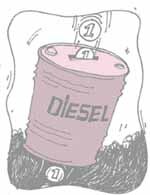 A few months earlier, diesel price was reduced by Re 1. So now we are back at the same thing, only now it is now in the form of cess. The money is supposedly going into the development and maintenance of the roads instead of going to the oil companies. There would not be much difference in consumption patterns. So there should not be much difference on the pollution just because of this." former head of transport department, School of Planning and Architecture, Delhi. "The hike of Re 1 is insignificant because the difference between diesel and petrol has not been bridged. It still is the same. There should be no dual pricing. In fact, there should be a complete bridging of the gap between the price of diesel and petrol. It is a question of priorities. Nothing has been done from the environment point of view. The two-wheeler sector has not been touched at all. the hike in the diesel price has nothing to do with any drive for the improvement of the environment or discouraging the use of diesel. It is purely from the revenue point of view" (see p58). "The Budget has nothing to do with the environment. The minor changes in the pricing will not affect anything as far as environment or pollution is concerned. Local policies are more important than the national Budget. It is a task of the state governments." "There is nothing [in the Budget] purely from the environment point of view. I would say this is a case of missed opportunities. There is a big gap between rhetoric and reality. If you talk about the environment, the Budget has to propose and facilitate remedial measures. The Budget is in fact a reflection of the concerns of the government. It seems that the Union ministry of environment and forests has no expertise on environmental economics. The government does have options. Things like pollution taxes, taxes on vehicles and their prices, raising the water cess, a concession on the prices of pollution control equipment. These are some of the issues that should have been addressed. But these are not to be seen anywhere" (see p59).